Whenever you go abroad to race you count on a cultural experience, but the details might be way, way off from your expectation. For example, I take it for granted that, going to any regatta in the USA where crews are invited and boats are provided, you will find a breakdown boat standing by for serious problems, plus a dedicated race committee vessel carrying spare parts and one or more eager mechanics. 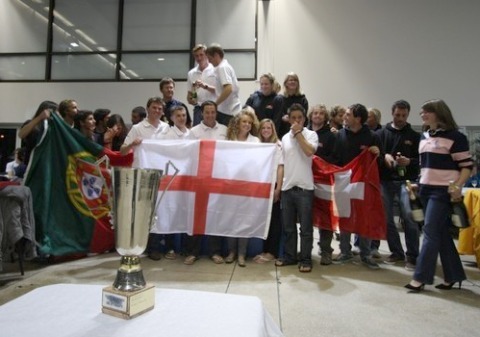 It was quite un-so at the Student Yachting World Cup in France, where Britain’s Southampton Solent University earned the win. As a partisan of California Maritime Academy, sailing as Team USA, I note that the team’s communications have studiously avoided any criticism of events following their assigned boat’s equipment failure, and I can honor that. When you’re invited for pie and coffee it’s impolite to criticize your slice of the pie, and I think they would be quick to point out there were a lot of races (abbreviated to 10) and 3 throwouts. But as an independent journo, not an alum of Cal Maritime, possessed of a few opinions as to how these things ought to be done and regarding the fortunes of other teams as well, I’m still looking for a way to say, Monsieur Dude, WTF? Cal Maritime opened with a third in race one, last week at La Rochelle, then was looking good in race two when a jib car went bust, “in such a way that a replacement block could not be attached to the car.” In the absence of backup parts and spares, the next two races were downhill from there. Hoping for redress, CMA went to the jury along with Team Canada, which had similar issues, but the response was on the order of, tough luck. Winds were in the twenties for what would be the final race, spinnakers were forbidden on the 32-foot loaners, and Cal Maritime—one of the few teams that would have been comfortable in those conditions—finished fifth, which also was their finish position for the series. With better breaks they might have had a shot at the top three, but this has been a learning curve experience—just being there was a big deal—and they never showed the chops that would have put them in first. Full marks to the teams from Switzerland and England who led throughout the regatta. According to my arithmetic (at this point I don’t find a wrapup on the event website at sywoc.org) Britain’s Southampton Solent University won the regatta by beating Ecole Polytechnique Fédérale de Lausanne in the final race. As I said for starters, they earned the win. Universidade Technica de Lisboa was third. Here’s why I’m confident of my arithmetic . . .
A record 85 solo skippers started the 9th Route du Rhum on Halloween Day, bound across the Atlantic in one of the must-do events for European singlehanders (and the short-course explanation of why participation in the Velux 5 Oceans is so thin). 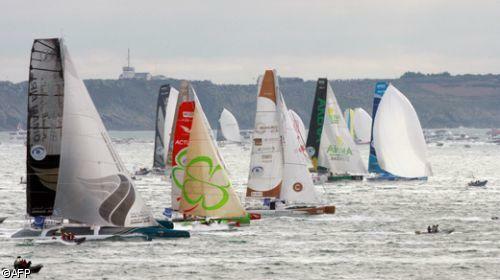 The start from St. Malo was upwind in a light breeze for nine giant multis, nine IMOCA Open 60’s, 12 Multi 50’s, 44 Class 40 monos, and 11 Rhum monos and multis. 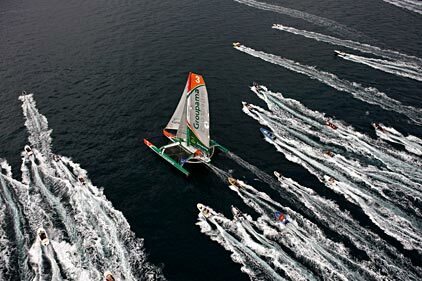 Franck Cammas on Groupama 3—Cammas skippered the boat’s 2010 fully-crewed around the world record of 48 days—took an early lead. Next stop, the Caribbean island of Guadaloupe. Here is Cammas on his way . . .
Charlotte Consorti isn’t the first hottie in kite sailing—South Africa’s Sjoukje Bredenkamp set the standard, and held the women’s speed sailing record for three years. Now we have Consorti, a French-Italian, as the first woman sailor to break 50 knots, this as the Luderitz Speed Challenge was winding down in Namibia. As with American Rob Douglas’ new absolute record of 55.65 knots, Consorti’s mark is pending ratification by the World Sailing Speed Record Council But, historically, the Luderitz people get these things right and their new records soon receive the stamp of approval. Meanwhile, I observe see that Charlotte Corsorti gets around, as a celebrity in la belle France.